Note: Only small quantities of D, E, H, I, and K are needed for this project. Our chubby cheek bad wolf looks like he has the confidence and power to blow down shabbily constructed homes in the pig-ster neighborhood. 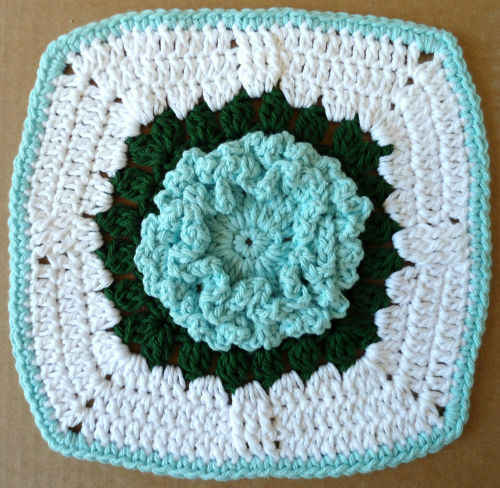 This is the perfect crochet pillow to accompany story time with a youngster and young-at-heart oldster. 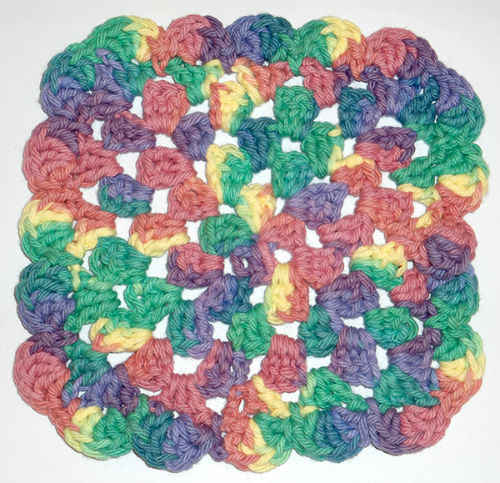 Gauge/Tension: GAUGE: 8 sts = 2” (5 cm); 8 rows = 2” (5 cm) in single crochet with larger hook. CHECK YOUR GAUGE. Use any size hook to obtain the gauge. sc2tog =[Insert hook in next stitch, yarn over and pull up a loop] twice, yarn over and draw through all 3 loops on hook. sc3tog = [Insert hook in next stitch, yarn over and pull up a loop] 3 times, yarn over and draw through all 4 loops on hook. through both loops on hook. 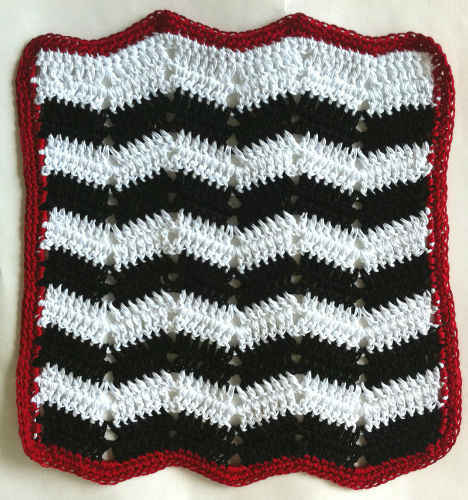 hook to complete stitch. Proceed with new color. Cut old color. With larger hook and A, ch 23. Row 1 (wrong side):Sc in 2nd ch from hook and in each ch across, turn—22 sc. Rows 2–10: Ch 1, sc in each sc across, turn;change to B at end of Row 10. Row 11: Ch 1, working in back loops only, sc in each sc across, turn. Rows 12–22: Repeat Row 2. Round 1 (right side): With right side facing, join B with sc in first sc, 2 sc in same sc (corner made), sc in each sc across to last st, 3 sc in last sc (corner made); working in ends of rows, work 20 sc evenly down side changing to A as needed to match rows; working in opposite side of foundation ch, 3 sc in first ch (corner made), sc in each ch across to last ch, 3 sc in last ch (corner made); working in ends of rows, work 20 sc evenly up side changing to B as needed to match rows; join with slip st in first sc—92 sc. Fasten off. Round 2: Join C with sc in first sc, sc in each sc around working 3 sc in center sc of each corner (corner made); join with slip st in first sc—100 sc. Round 3: Ch 1, working back loops only, sc in each sc around working 3 sc in center sc of each corner (corner made); join with slip st in first sc—108 sc. Fasten off. Row 1: With right facing and working in unworked front loops of Row 11, join C with sc in first sc, sc in each sc across—22 sc. Rows 1–10: With D, work same as Rows 1–10 of house of bricks. Rows 11–22: With E, work same as Rows 11–22 of house of bricks. Round 1: With E and D, work same as edging of house of bricks. Rounds 2 and 3: Work same as Rounds 2 and 3 of edging of house of bricks. Work same as windowsill of house of bricks. Rows 1–10: With B, work same as Rows1–10 of house of bricks. Rows 11–22: With F , work same as Rows 11–22 of house of bricks. Round 1: With F and B, work same as edging of house of bricks. Rows 1–10: With J, work same as Rows 1–10 of house of bricks. Rows 11–22: With I, work same as Rows 11–22 of house of bricks. Round 1: With I and J, work same as edging of house of bricks. Work all pieces with smaller hook. Round 2: Work 2 sc in first sc, sc in next 3 sc, 2 sc in next 3 sc, sc in next 3 sc, 2 sc in last 2 sc—18 sc. Round 3: *Sc in next 2 sc, 2 sc in next sc; repeat from * around—24 sc. Round 4: *Sc in next 3 sc, 2 sc in next sc; repeat from * around—30 sc. Round 5: *Sc in next 4 sc, 2 sc in next sc; repeat from * around; join with slip st in first sc—36 sc. Fasten off. move up as each round is completed. Round 2: Work 2 sc in each sc around— 2 sc. Round 3: Working in back loops only, slip st in each sc around; join with slip st in first slip st. Fasten off. Row 1 (right side): Work 5 sc in 2nd ch from hook, turn—5 sc. Row 3: Ch 1, sc in first sc, sc3tog, sc in last sc, turn—3 sc. Row 4: Ch 1, sc in each sc across, turn. Row 5: Ch 1, sc3tog (tip of ear made)—1 sc. Row 1 (right side): Sc in 2nd ch from hook and in each ch across, turn—14 sc. Rows 2 and 3: Ch 1, sc in each sc across, turn. Rows 4 and 5: Ch 1, sc2tog, sc in each sc to last 2 sc, sc2tog, turn—12 sc. Row 1 (right side): Sc in 2nd ch from hook and in each ch across, turn—8 sc. Rows 2–5: Ch 1, sc in first sc, 2 sc in next sc, sc in each sc to last 2 sc, 2 sc in next sc, sc in last sc, turn—16 sc. Row 6: Ch 1, sc in each sc across, turn. Rows 7–9: Ch 1, sc in next sc, sc2tog, sc in each sc to last 3 sc, sc2tog, sc in last sc, turn—10 sc. Row 10: Ch 1, sc2tog, sc in each sc to last 2 sc, sc2tog, turn—8 sc. Rows 11–13: Ch 1, sc in each sc across, turn. Row 14: *Ch 5, slip st in 2nd ch from hook, sc in next ch, hdc in next ch, dc in last ch (ear made)*, skip first 2 sc, slip st in next 3 sc; repeat from * to * once, skip next 2 sc, slip st in last sc. Fasten off. Round 1: Work 6 sc in 2nd ch from hook; join with slip st in first sc. Fasten off. Row 1 (right side): Sc in 2nd ch from hook and in each ch across, turn—5 sc. Rows 2–4: Ch 1, sc in each sc across, turn; change to F at end of Row 4. Rows 5 and 6: Ch 1, 2 sc in next sc, sc in next 3 sc, 2 sc in last sc, turn—7 sc. Rows 7 and 8: Ch 1, sc in each sc across, turn. Row 1 (right side): Sc in 2nd ch from hook and in each ch across, turn—50 sc. Row 2: Ch 3 (counts as first dc here and throughout), dc in each sc across, turn. Row 3: Ch 1, sc in each dc across, turn. Row 4: Ch 3, dc in each sc across, turn. Row 5–36: Repeat Rows 3 and 4 sixteen times. Round 1 (right side): Ch 1, 3 sc in first sc (corner made), sc in each sc across to last sc, 3 sc in last sc (corner made); *working 1 sc in end of sc rows and 2 sc in end of dc rows, work 54 sc across side*; working in opposite side of foundation ch, 3 sc in first ch (corner made), sc in each ch across to last ch, 3 sc in last ch (corner made); repeat from * to * once; join with slip st in first sc—216 sc. Fasten off. Round 2: Join C with sc in first sc, sc in each sc around working 3 sc in center sc of each 3-sc corner; join with slip st in first sc—224 sc. Round 3: Ch 1, working back loops only, sc in each sc around working 3 sc in center sc of each 3-sc corner; join with slip st in first sc—232 sc. Fasten off. 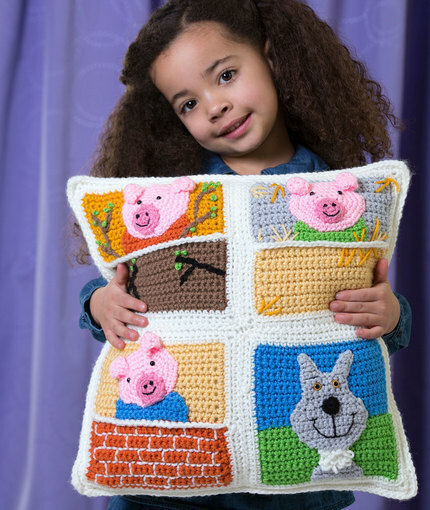 Use photograph as a guide for placement of stitches and squares. thereafter. Separate bricks with back stitches worked vertically between horizontal lines. House of Sticks With D and K, embroider chain stitches for branches on each section. With J, embroider French knot leaves on branches. House of Straw With B and E, embroider as many straight stitches as desired for pieces of straw. Snout With 6 strands of embroidery floss, embroider French knot nostrils and back stitches for smile. Sew snout in place. Insert black eyes and secure. If desired, vary the placement of eyes on each pig so faces appear different. Ears Sew first row of ear to head, then pull tip of ear down over last 2 rounds of head. Shirt Sew shirt in place on upper section of square. Place head on top edge of shirt and sew. Sew nose on head. Embroider back stitches for smile. Insert yellow eyes and secure. With C, work a small back stitch over the first stitch of Row 8 of neck, work next back stitch close to the first allowing a ½-¾” (1.5-2 cm) long loop to form; *holding the loop in place, work next back stitch close to the last one made; repeat from * as many times as needed to create loops and back and forth across all C rows. Fasten off. Sew neck and head to wolf panel. Arrange houses and wolf panel and sew together through both sets of loops. Pull tails to wrong side of front panel to minimize weaving in ends. Hold front and back panels with wrong sides together, matching corners and easing sides to fit. Round 1: With larger hook and working in both sets of loops, join C with sc in center sc of any corner, 2 sc in same sc, *sc evenly spaced across to next corner, 3 sc in next corner; repeat from * twice; insert pillow form, sc evenly spaced across last side; join with slip st in first sc. Fasten off. *= repeat whatever follows the * as indicated.